Hot on the heels of being named Field Manager of the Year at the recent Franchise Council of Australia (FCA) WA Excellence in Franchising Awards, multi award-winning Perth businessman and Poolwerx franchise manager Darrell Doust will now share his expertise abroad as a development partner in the Poolwerx US branch. Mr Doust, previously the Business Development Manager for West Australia, has been instrumental in growing Poolwerx’s business over 12 years with the company. 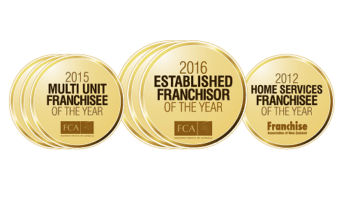 He said while he was flattered to be recognised by the industry body, the real thanks needed to go to the 13 franchise partners he managed. Mr Doust founded pool and spa care business JAG Poolcare in Perth before selling his business to Poolwerx in 2003 as part of a growth strategy. He eventually graduated from operating his own Poolwerx franchise to managing the entire network of franchise partners across the state as the Master Franchisee in the region. The success he, along with his wife Diane, were able to achieve led the franchisor to the conclusion they would be the perfect management team to guide new franchise partners in America. Poolwerx CEO John O’Brien said Darrell was very deserving of all the accolades that had come his way. Darrell and his wife Diane have won many accolades for their service in West Australia. Darrell previously won the FCA Field Manager of the Year in 2013, with the couple also winning the award together in 2010.